When Jewish Voice for Labour was formed last summer I welcomed it whilst warning of the dangers of not having clear politics, strategy or direction. I opposed not only its two tiers of membership – Jewish and non-Jewish – but its refusal to squarely support the Palestinians’ fight for justice and the Right of Return of Palestinian refugees. Although most JVL members are opposed to Zionism there is a belief that some things are best left unsaid. The group is also unclear as to whether its main purpose is as some kind of Jewish cultural formation or whether it is primarily a political organisation. Opposition to the anti-Semitism witch hunt or the affiliation and privileged status of the Jewish Labour Movement was not mentioned in its founding statement. Nor does it say anything about about the racist nature of the Israeli state. I wrote a number of articles warning of the consequences of not being clear or honest such as Timidity is not a Strategy, and Jewish Voice for Labour & the Politics of Self-Indulgence - Nothing to say on Palestine or Zionism. For the past few weeks we have had a relaunch of the anti-Semitism campaign. There is no doubt that this is intended both to damage the chances of Labour in the local elections and also to act as a prelude to the removal of Corbyn himself. The campaign began with the affair of the mural and then an absurd ‘anti-racist’ demonstration on March 26th outside Parliament by about 500 Zionists. It is probably the first and last ‘anti-racist’ demonstration which the DUP and Norman Tebbit attend! To its credit the JVL organised a counter-demonstration but as the attacks have mounted JVL have gone quiet. This week another of the ‘anti-Semitism’ victims, Marc Wadsworth, was up before Maggi Cosins and the National Kangaroo Court. To date both Cyril Chilson and me have been expelled. The allegations by Ruth Smeeth MP that she was subject to anti-Semitic comments at the Chakrabarti press conference by Marc are a complete lie as can be seen in the video. Nothing was said that was remotely anti-Semitic. giving evidence against Mark Wadsworth – the guy who abused her at the antisemitism inquiry launch – and we expect there to be a protest outside against her. Marc, as anyone who watched the recent BBC programmes The Murder that Changed a Nation on the Stephen Lawrence murder, would know, played an integral role in the campaign. Marc has been one of Britain’s best known Black anti-racists. It is a scandal that he has been suspended for nearly 2 years because of allegations by a supporter of the world’s only Apartheid state, Israel. It is also scandalous that JVL took a decision not to support the lobby of Marc’s hearing. JVL didn’t want to be seen to oppose Streeting’s all-white group of right-wing MPs. In essence they took fright. This is sheer political cowardice. It is also the road to disaster. JVL seem to believe that if they are good boys and girls then Jeremy will look kindly on them and rearrange the now postponed meeting he was going to have with Jewish groups. This is an utter illusion. Despite this a few individual JVL members came along, including Glynn Secker. The purpose of the witch-hunt is not to expel Jackie, Marc or myself. It is either to remove or neuter Corbyn. Far from abstaining from support those of us fighting the witch hunt JVL should be in the forefront of the fight. Whilst the Zionists are on the rampage JVL decided to do nothing. Originally Free Speech on Israel, which consists of many of the same people as JVL, was set up because of the weaponisation of anti-Semitism. It would appear that they have given up on free speech. 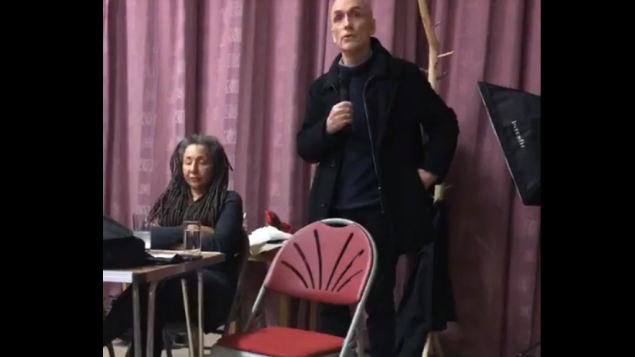 Likewise the Jewish Socialists Group, which worked alongside Black anti-racist activists like Marc, have kept quiet over the witchhunt and appear to have given up on socialism and Jewish Voice for Labour seem to have lost their voice altogether. However Labour Against the Witch-hunt went ahead with the protest despite Corbyn’s office contacting Marc and asking him to call off the protest. Quite rightly Marc refused. The idea that keeping quiet and saying nothing will aid Jeremy Corbyn is absurd. The purpose of the witch-hunt and the false accusations of anti-Semitism is to remove Corbyn. Jackie, Marc and me are simply collateral damage. Saying nothing will strengthen not weaken the Right. President JONATHAN ARKUSH, BOD - addressing rally Grosvenor SQ. July '16 where JDL openly wore KAHANE shirts. Far from abstaining from protests we should be redoubling our efforts to reselect creatures like Streeting, Smeeth, Berger and Ryan. The Right will not give up and appeasing them is likely to destroy the Corbyn project and the prospect of him becoming Prime Minister. It is time that people realise and understand that the goal of Streeting, John Mann and co. is to prevent Corbyn becoming Prime Minister. Last June’s General election was a set back for them which is why we have seen the false anti-Semitism campaign being stepped up. 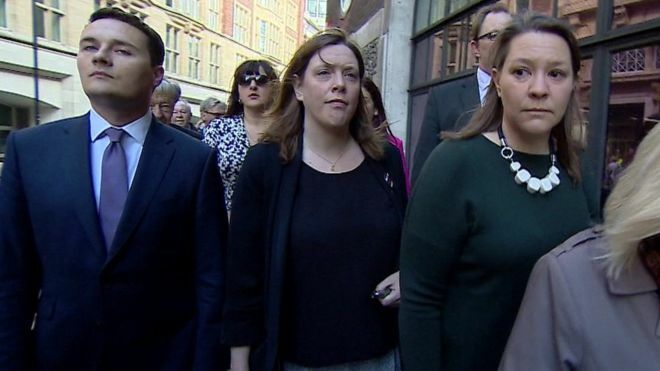 When Streeting and his 20 white racists reached Church House, the venue where the Kangaroo Court was sitting, it was they who felt intimidated and Streeting could be seen bleating about how terrible it was that people had exercised their right to free speech. It is excellent that Chris Williamson MP, despite the pressures on him, not least by people like Barry Gardiner, refused to be cowed and gave evidence in support of Marc Wadsworth. Clive Lewis MP has also given Marc his support. The decision of the JVL leaves friendly MPs in an even more exposed position. We had 70 people on the demonstration as it was but with the support of JVL and FSOI we could have had even more. 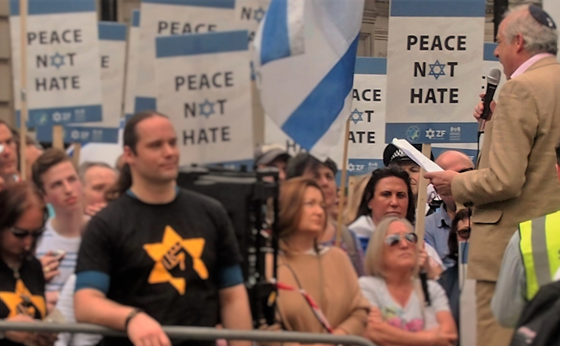 We have a situation where the representatives of the Israeli state – Labour Friends of Israel and the JLM, the ‘sister party’ of the openly racist Israeli Labour Party, operate openly inside the Labour Party. In May 2012, the ILP’s previous leader Isaac Herzog wrote an opinion piece arguing that Eritreans in Israel didn’t deserve protection as refugees. Today it openly supports Netanyahu’s attempts to deport Israel’s 40,000 Black African refugees for the crime of being Black and not Jewish. Last week the new leader of the Israeli Labour Party, Avi Gabbay issued a letter cutting his links with Jeremy Corbyn because of ‘anti-Semitism’. The ILP’s previous leader Herzog declared that his nightmare was waking up to find that Israel had a Palestinian Prime Minister and 61 Palestinian Members of Israel’s Knesset. Herzog also spoke about the false impression that the ILP were ‘Arab Lovers’. Gabbay has gone one better. He declared that he would not join a coalition with members of the Joint List, the representatives of Palestinian citizens of Israel. An Palestinian party has never been part of a government in Israel. It is an unwritten Zionist convention that Arab parties do not take part in the government of a Jewish state. In conjunction with Labour’s Right, supporters of Israel and the Zionist movement have waged an ongoing campaign of destabilisation. The pretext is ‘Anti-Semitism’. 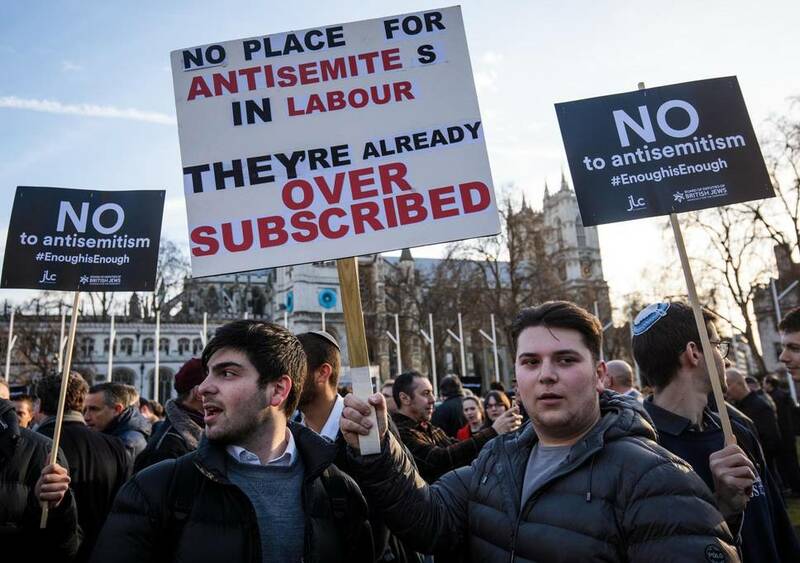 The hollowness of this campaign is shown by the demands of Jonathans Arkush and Goldstein of the Board of Deputies of British Jews and Jewish Leadership Council. 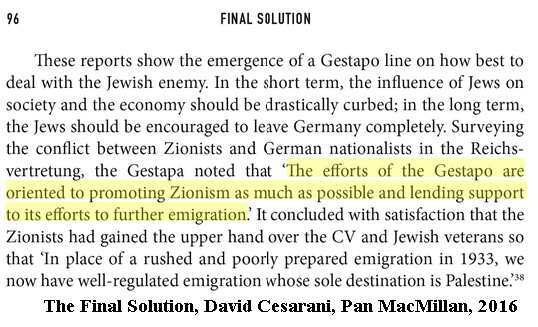 The Zionists accuse Livingstone of 'antisemitism' for saying that Hitler supported Zionism - above is an extract from Zionist historian David Cesarani's book which says exactly the same! Sadly, this is the kind of behaviour we have come to expect from Chris Williamson. We called for him to be sacked last year from the shadow cabinet over outrageous comments labelling claims of antisemitism in Labour ‘a dirty lowdown trick’. Arkush is a right-wing Tory, who welcomed Donald Trump to power despite the anti-Semitism of his campaign. According to Dana Milbank in the Washington Post Anti-Semitism is no longer an undertone of Trump’s campaign. It’s the melody. See Trump Rolls Out Anti-Semitic Closing Ad for an analysis. That however does not disturb Arkush because these anti-Semites are also pro-Israel. Of course if you claim that the Zionist anti-Semitism claims are false or weaponised then that too is anti-Semitic! However in the same breath they tell us that Zionism is a part of Jewish identity and to oppose the ‘Jewish’ state is anti-Semitic. Or in the words of the Jewish Chronicle’s Editor Stephen Pollard Jeremy Corbyn made ‘the odd assertion that anti-Zionism is not antisemitic’. Jewdas or Judas? - Who’s Betraying Whom?